Just like any great movie, your wedding should have an amazing soundtrack. It wouldn’t be complete without having live wedding musicians perform at your intimate ceremony. Create an unforgettable experience by including one of our professional musicians in your wedding package. Live music can set the tone for your wedding ceremony and reminds you and your guests that this is a once-in-a-lifetime event. Whether you are looking for an authentic "Vegas-Style" ceremony by having Elvis take your wedding stage to marry you or having a romantic ceremony with sounds of a harp filling the chapel as you walk down the aisle, we have something for everyone. Personalize your wedding by adding one of our highly experienced musicians. Ceremony music is included in all our packages, and some may include one of our live music options. Contact your wedding planner for more information about the wedding packages that include live music or how to book a musician for your elegant Las Vegas wedding! Fill the air with a traditional touch! 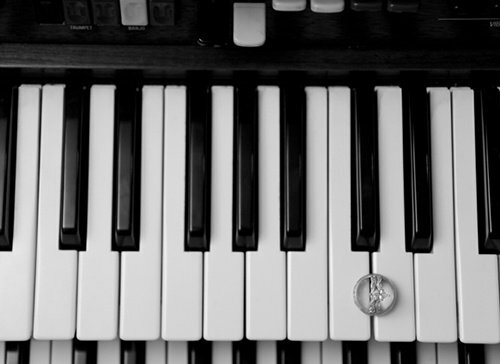 Our live organist will play the traditional instrumental wedding music during your ceremony. Please contact your Personal Wedding Planner to make sure the organist is available for your ceremony. Let our guitarist create a romantic setting for your special day. Performing traditional and contemporary wedding processional music, the sweet melodies from the guitar is sure to please you and your guests. Please contact your Personal Wedding Planner to make sure the guitarist is available for your ceremony. Have “The King” of Rock ‘n’ Roll at your wedding! Elvis will serenade you by singing three of his famous songs and witness your “I dos”. Please contact your Personal Wedding Planner to make sure Elvis is available for your ceremony. Our violinist will add an elegant touch playing the most timeless pieces of live wedding music for your ceremony. Please contact your Personal Wedding Planner to make sure the violinist is available for your ceremony. Create an inviting and airy setting at your ceremony with soothing music from the harp. Our skilled harpist will play from a pleasant selection of classical wedding ceremony music during your ceremony. Please contact your Personal Wedding Planner to make sure the harpist is available for your ceremony.